The Review: This films can very well be this year’s best compedium of caricatures and contrivances, and Vilma Santos has greatly suceeded in tarnishing her silver star with an hysterical homage to bothersome bathos. This abysmal melodrama begins and ends with a slight promise of something short of superb senselessness. Unfortunately, it breaks the promise; yet it rabidly recreates a deluge of disasters gladly survived by the superhuman will to ruthlessly exploit the baser sentiments of the moviegoers. True enough, the plot works and hurls Santos’ Monica into a miasma of perfectly orchestrated tragedies thus eliciting a fanaticism that enchants the heartland of sighing domestics and swooming dummies. And once more, sense and sensibility are lost in the celluloid cartograph of caricatures. Everything, indeed, is wrong in this film. The story is dreadfully downbeat. The screenplay is incredibley talky and torturously maudlin with dialogues aspiring for grandiosity yet indulfeing in petty praochial prattle. Grossly inspired by the Fifties classic Magnificent Obsession, this film wantonly lingers through a comatose celebration of tears and middle-class hysteria. The direction listlessly lapses into the familiarity tacky Perez autism, but neither elegant nor eerie. From the opening production number to the last shot of the film revealed that particularly plebeian Perez panache. The Di Na Natuto sequence then becomes an encyclopedia of shots inspired by aspirational advertisements of toothpaste, softdrinks, jeans, and walkmans. Those isolated shots of Gary Valenciano against the San Sebastian stained glass rose window are obviously common man’s fantasy. 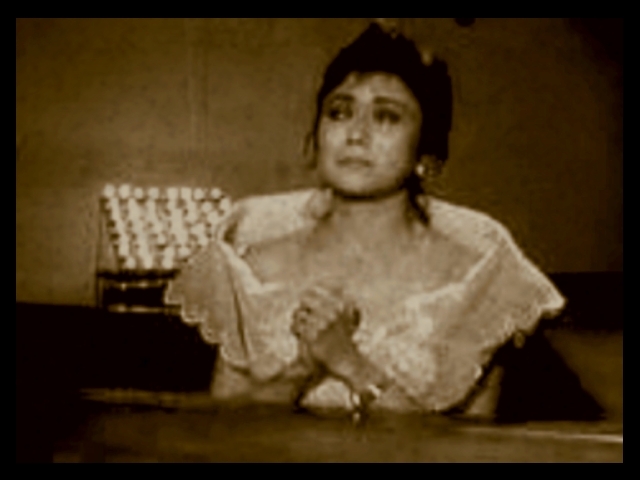 Valenciano (Gilbert) and Santos’ (Monica) final confrontation in a scene straight out of a radio soap series. Yet there is an eminently indiscriminate luxe in the film’s visuals. And the production design scuttles from nouveau baroque hysteria to decotif humdrum. Even the Fabregas film scroe sweetly swings from pedestrian pop to neoclassic pretense. Evidently, the film style is anxiously eclectic and nervously apopleptic. Miserably, all the actors failed in their grand gesture to play caricatures instead of characters. Despite Valenciano’s evident poetic grace, his Gilbert emerges as a scarecrow of what should have been a divine anti-hero. It’s a pity that he can’t definitely pinpoint Gilbert angst. Thus he limps into a heartful of hollow anger and affected languor. And the effete pretty boy caricature of Eric Quizon’s Emil doesn’t offer any salvation either, even if he literally gives his eyes to Monica. Quizon’s reading of the Emil role is clearly based on the shallow assumption that nice boy die young, and with brain cancer or other such maladies requiring high tech cure yet. Despite his shallowness of conviction, however, Quizon manages in a few isolated scenes though to imbue his role with ephemeral terror. In another variation of caricature, Miguel Rodriguez’s Mario is too dark for comfort. The updated yet needlessly overblown rendition of his character as caricature truthfully affirms a directorial styel that borders between irritation and consternation. Armida Siguion Reyna has justly succeeded in echoing her cinematic lifework of caricatures, this time, as Portia. And Nida Blanca’s rendition of maternal massochism ruefully regresses into moronic moroseness. Barbara Perez’s Elvie is largely languishing in love’s limbo. Eddie Garcia’s Emmanuel Vera becomes a fitting monument to guilt and philanthropy corroded by massive ineptitude emanating from the actor’s performance, Perla Bautista is sublimely reduced to a prop, a piece of dust, a whiff o wind. Even Vangie Labalan’s maid character promises great caricature. This entry was posted in ARTICLES, FILM REVIEW and tagged Elwood Perez, FILM REVIEW, FILM REVIEW: IBULONG MO SA DIYOS, Gary Valenciano, Ibulong Mo Sa Diyos (1988), Miguel Rodriguez. Bookmark the permalink.